Falmouth Arts Alive Opens Tonight! Performances All Weekend! 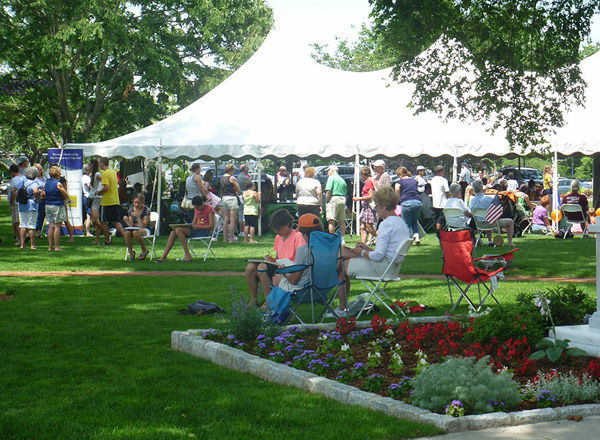 Arts Alive Opens tonight on the Falmouth Library Lawn at 5 PM with a Drum Circle led by percussionist Lisa Esperson. All are invited to attend. Some drums will be available; attendees are welcome to bring their own percussion instruments. The Falmouth Academy Cool Nights Jazz Band follows at 6 PM. Students play and improvise all styles of jazz, including blues, swing, rag, rock, and pop. The Town Dance takes place from 7 to 9 PM and features the Bart Weisman Group with vocalist Tish Adams. The Bart Weisman Group is well known-throughout the Cape performing a blend of jazz, Latin, pop, funk, fusion, blues, and rock. Tish Adams offers sentimental slow, smoky ballads and up-tempo swing tunes. The Arts Alive Festival ’15 continues Saturday 10 AM to 9 PM and Sunday 11 AM to 5 PM, rain or shine. Artisans and crafters will have their wares on display on the adjacent Shore Street Extension. All performances are free and take place continuously in three large tents on the lawn. For the exact times and tent locations of performances, visit to ArtsFalmouth.org or look for the Festival programs available in the tents at the Raffle and Drinks tables in the vendor area. Programs are also available at many shops and restaurants on Main Street. New this year are art demonstrations by local artists. Doug Rugh and Hillary Osborn, who can usually be found at the easels at their fine art studio and gallery at Queens Buyway in Falmouth will each be offering a demonstration. Rugh will paint a portrait from a live model using the “alla prima” (all-at-once) method which requires the artist to capture just the essentials of a likeness. Osborn will discuss how she brings life to objects as she paints a still-life composition on canvas. Led by Ruth Leech, the Falmouth Artists Guild’s “Friday Figure Class” will demonstrate how to draw the figure from life, using a live model. These painting demos are suitable for all ages, and questions are welcomed. Falmouth Community Television (FCTV, Channel 13) Youth Producers, under the direction of Allen Russell, show how to create a television show. Caroline Hopewell, from the Waldorf School, presents an interactive display of the ancient art of rope-making with weights and pulleys to create jump ropes and more. The art of the dance is timeless, but specific to different cultures. Student ballerinas from the Turning Pointe Dance Studio will perform classic ballet from the western tradition, while two groups will demonstrate the traditions of the Middle East. Khadija, who teaches Middle Eastern dance and culture and leads tours to the Middle East will present belly dancing from Egypt. Elena Griffin, formerly at the Cape Conservatory, encourages participation in her presentation of Middle Eastern dance. Especially for children and the young at heart are Janoah Bailin, who will juggle and ride a unicycle, and Mr. Bubble, with his amazingly huge bubbles. Treasure Time Storybook Theater, led by Lee Dresher, a staple at Arts Alive, will read a children’s book, sing songs and play guitar, encouraging children to actively participate in games, singing, and dancing. WhirlyGigs is a one-man band performing toe-tapping tunes for the whole family. Local children’s writer and teacher T.M. Murphy will give a lesson in suspense writing for kids ages 9 and “way up.” He is the author of the acclaimed Belltown Mystery Series for kids 10-14 and was selected as “One of the 400 Cape Cod People Who Brighten Our Lives” by Cape Cod Life Magazine. A special new event this year is an Open Mic session, at 4 PM on Saturday, which will be open to all performing artists, both children and adults. Poets, storytellers, singers, musicians, and other entertainers are invited to perform. Sign up a few minutes before the show in the Music Tent. The Cape Conservatory Jazz Ensemble, directed by Ty Newcomb, has a swinging big band sound and performs throughout the Cape. Falmouth High School teachers and guidance counselors (and an occasional guest) make up the 11-piece band Puffy Elvis, which performs blues, funk, and classic rock. Talented women will perform in a variety of ways. Ej Mills Brennan will play solo Native American flute and early classical guitar. Belleweather is a 12-member a cappella women’s chorus. Lisa Esperson will direct the Universal Sound percussion performance on Saturday. Returning this year is Mark Borgman and Friends, a classic jazz quartet that play jazz, funk, blues, the Great American Songbook, and popular music. Vocalist Liz Saunders is joined by Frank Barberio on sax, Rich Cain on bass, Michael Gross on drums, and Borgmann on piano. New to Arts Alive, but not the Cape, is the Cape Cod Sax Quartet featuring Berke McKelvey on soprano sax, Maurice Soque on alto sax, Ryder Corey on tenor sax, and Nicholas Suchecki on baritone sax. Vic Solo will be performing as Elvis Presley, complete with white jumpsuit and gyrations to the beat of Elvis’s greatest hits. Singer/songwriters are always a highlight of Arts Alive. This year, they are a diverse lot. Returning this year are Conner Anderson, Eric Treehouse and Rob Parks. Treehouse plays acoustic melodies and modern alternative rock, while Parks melds a pop-punk energy with soothing vocals. New is Richard O’Connor plays 12-string guitar, mandolin, and guitar and will perform folk-rock from the 60s to the 90s, as well as original songs. Matt Borrello is an award-winning singer/songwriter who writes from personal experience and draws his inspiration from folk, country, blues, and rock music. Grace Morrison incorporates influences from many sources into her music: from country and pop to traditional Celtic music. Her songs tell stories from history and from her own personal experiences. Broadway is well-represented. Actors from the Woods Hole Theater Company will perform musical numbers from Godspell, their current production at Woods Hole Community Hall, and other musical comedy productions. The Falmouth Theatre Guild will perform solos, duets and group numbers from past and upcoming musicals. Friends of Broadway is a high energy, non-stop musical revue by girls and young women who perform across the country. Fiddle talent is plentiful in Falmouth. Cat’s Melodeon, led by Bill Black, performs Irish traditional music on fiddle, flute, recorder, accordion, banjo, guitar, uilleann pipes, and bodhrán. The Sonnay Fiddlers play traditional and international fiddle tunes. The group is made up of students of Nikki Engstrom, an award-winning fiddler and a member of the Celtic duo Stanley and Grimm. Led by Jim Boyce, the Falmouth Fiddlers play and sing old-time, bluegrass, and Celtic tunes on fiddle, mandolin, guitar, banjo, dobro, tin whistle, bodhran, cello, and string bass. Fiddler Amy Larkin and her band play spicy Cajun, Celtic, and traditional Appalachian tunes and driving contradance music. Manny and Linda Dias are The Familiars of Cape Cod. They sing and play folk, fiddle, country, Irish and popular music. Led by Emily Parasiliti, The Coteries are an acoustic Americana trio playing roots, folk, and blues on guitar, mandolin, and banjo, with vocals. At 2 PM on Sunday, all are invited to bring their fiddle and folk instruments to an open session of old-time, Celtic, and other traditional music. Or just sit back and listen. Country Music is new to Arts Alive, but this year two bands will present the music beloved by much of America. Haywired plays Texas, rollicking red dirt, and modern country rock music. It features Ryan Benoit on vocals and guitar, Randy Frost on lead guitar and vocals, Tim White on bass and vocals, and Steve Andreasson on drums. Hit country tunes from the 40s through the 70s are played by Yesterday’s Country Band. Members include Paul Fata on vocals and acoustic guitar, Jack Meserve on vocals and lead guitar, Bill Kiesewetter on keyboards, Ben Carnevale on pedal steel and electric guitar, and Harry Baum on fretless bass guitar. Rock Fest is a highlight of Arts Alive that runs from 6 to 9 PM in all three tents. Returning this year are Heartbreaker, the Led Zeppelin tribute band, Just Like That, a party rock and roll dance band, and Paradise Rock, a group that plays original and classic rock with some bluesy funk. Smooch Paywell performs Chicago blues from the 50s and 60s on harmonica, guitar, bass guitar, drums, and vocals. New this year are Needle Beach with Brian Youmans, vocals and guitar; Sam Houghton, bass guitar; Stew DesMeules, guitar; and Ryan Bray, drums, Their sound is described as old-fashioned “loud and dirty” rock and roll tunes inspired by bands like the Rolling Stones, the Black Angels, and Velvet Underground. Classic rock is also played by The Most, led by Lewis “Binky” Anderson on drums. Sons of Beaches, featuring David Warren, plays classic rock. ArtsFalmouth is a non-profit umbrella organization that celebrates and promotes Arts and Culture in Falmouth and the Upper Cape. ArtsFalmouth appreciates the support of the financial supporters of Arts Alive: The Enterprise, New Balance Falmouth Road Race, Falmouth Village Association, Woods Hole Foundation, Bank of Cape Cod, Arts Foundation of Cape Cod, The Martha’s Vineyard Savings Bank, Cape Cod 5, Wood Lumber, Cooperative Bank of Cape Cod, Falmouth Cultural Council, Mutual Bank, and First Citizens Federal Credit Union. The Festival would not be possible without the support of the Selectmen, The Library Trustees and various town departments. For a full schedule of performance times, a list of all the artisans and vendors and all the extras, visit ArtsFalmouth.org.